Reporter and Curator: Dr. Sudipta Saha, Ph.D.
MicroRNAs (miRNAs) are a group of small non-coding RNA molecules that play a major role in posttranscriptional regulation of gene expression and are expressed in an organ-specific manner. One miRNA can potentially regulate the expression of several genes, depending on cell type and differentiation stage. They control every cellular process and their altered regulation is involved in human diseases. miRNAs are differentially expressed in the male and female gonads and have an organ-specific reproductive function. Exerting their affect through germ cells and gonadal somatic cells, miRNAs regulate key proteins necessary for gonad development. The role of miRNAs in the testes is only starting to emerge though they have been shown to be required for adequate spermatogenesis. In the ovary, miRNAs play a fundamental role in follicles’ assembly, growth, differentiation, and ovulation. Deciphering the underlying causes of idiopathic male infertility is one of the main challenges in reproductive medicine. This is especially relevant in infertile patients displaying normal seminal parameters and no urogenital or genetic abnormalities. In these cases, the search for additional sperm biomarkers is of high interest. This study was aimed to determine the implications of the sperm miRNA expression profiles in the reproductive capacity of normozoospermic infertile individuals. The expression levels of 736 miRNAs were evaluated in spermatozoa from normozoospermic infertile males and normozoospermic fertile males analyzed under the same conditions. 57 miRNAs were differentially expressed between populations; 20 of them was regulated by a host gene promoter that in three cases comprised genes involved in fertility. The predicted targets of the differentially expressed miRNAs unveiled a significant enrichment of biological processes related to embryonic morphogenesis and chromatin modification. Normozoospermic infertile individuals exhibit a specific sperm miRNA expression profile clearly differentiated from normozoospermic fertile individuals. This miRNA cargo has potential implications in the individuals’ reproductive competence. Circulating or “extracellular” miRNAs detected in biological fluids, could be used as potential diagnostic and prognostic biomarkers of several disease, such as cancer, gynecological and pregnancy disorders. However, their contributions in female infertility and in vitro fertilization (IVF) remain unknown. Polycystic ovary syndrome (PCOS) is a frequent endocrine disorder in women. PCOS is associated with altered features of androgen metabolism, increased insulin resistance and impaired fertility. Furthermore, PCOS, being a syndrome diagnosis, is heterogeneous and characterized by polycystic ovaries, chronic anovulation and evidence of hyperandrogenism, as well as being associated with chronic low-grade inflammation and an increased life time risk of type 2 diabetes. Altered miRNA levels have been associated with diabetes, insulin resistance, inflammation and various cancers. Studies have shown that circulating miRNAs are present in whole blood, serum, plasma and the follicular fluid of PCOS patients and that these might serve as potential biomarkers and a new approach for the diagnosis of PCOS. Presence of miRNA in mammalian follicular fluid has been demonstrated to be enclosed within microvesicles and exosomes or they can also be associated to protein complexes. The presence of microvesicles and exosomes carrying microRNAs in follicular fluid could represent an alternative mechanism of autocrine and paracrine communication inside the ovarian follicle. The investigation of the expression profiles of five circulating miRNAs (let-7b, miR-29a, miR-30a, miR-140 and miR-320a) in human follicular fluid from women with normal ovarian reserve and with polycystic ovary syndrome (PCOS) and their ability to predict IVF outcomes showed that these miRNAs could provide new helpful biomarkers to facilitate personalized medical care for oocyte quality in ART (Assisted Reproductive Treatment) and during IVF (In Vitro Fertilization). The theory that the brain has a positive response to art is not new to science. 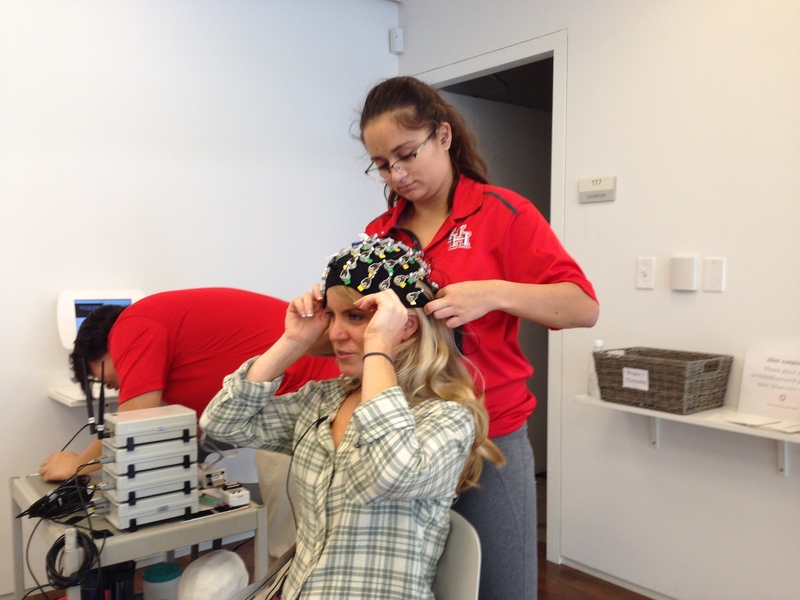 But a researcher at the University of Houston is using a different approach to test that belief. This is your brain. This is your brain on art. Any questions? 🍳🤗🎨🗝 yes in fact this raises a TON of questions! When I’m at an art museum, I never know what piece will catch my eye. On this particular visit to the University of Houston’s Blaffer Art Museum, it’s an art installation by Matthew Buckingham. 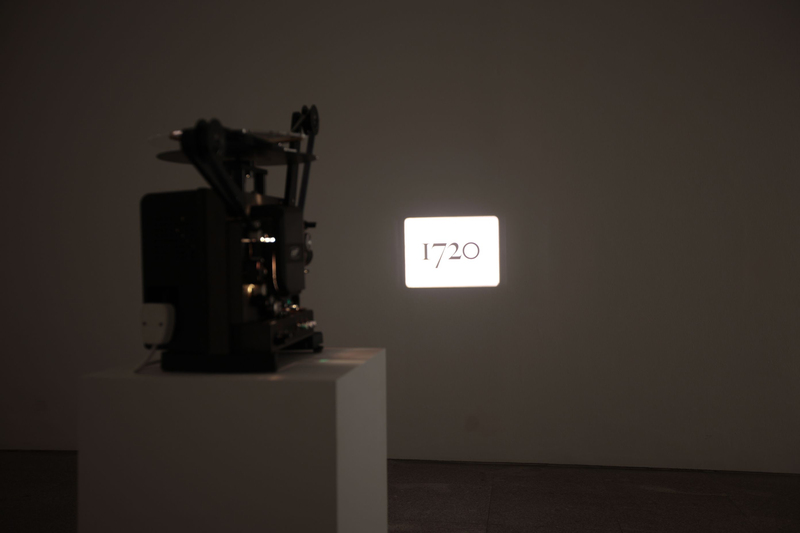 It consists of is a 16-millimeter film projector on a pedestal, projecting a flickering black and white image of the numbers “1720” on a small screen suspended in mid-air. The music coming from the projector is a baroque flute sonata by Bach. Matthew Buckingham’s exhibit, “1720” (2009) is a continuous 16 mm film projection of the date on a suspended screen. A movement from Bach’s Sonata in G for Flute and Continuo plays as the soundtrack accompanied by the flickering sound of the film reel. So, if someone could look into my head at this moment and see what’s going on in my brain, would they be able to see that I like what I’m looking at? Dr. Jose Luis Contreras-Vidal, (better known as “Pepe”) is in the process of finding out. The University of Houston College of Engineering professor is collecting neural data from thousands of people while they engage in creative activities, whether it’s dancing, playing music, making art, or, in my case, viewing it. “(The hypothesis is) that there will be brain patterns associated with aesthetic preference that are recruited when you perceive art and make a judgement about art,” Contreras-Vidal says. Last October, three local artists – Dario Robleto, JoAnn Fleischhauer, and Lily Cox-Richard – took part in an event that allowed people to watch what was going on in their brains as they created art. The process involved fitting each artist with EEG caps, which look like swim caps with 64 electrodes attached. 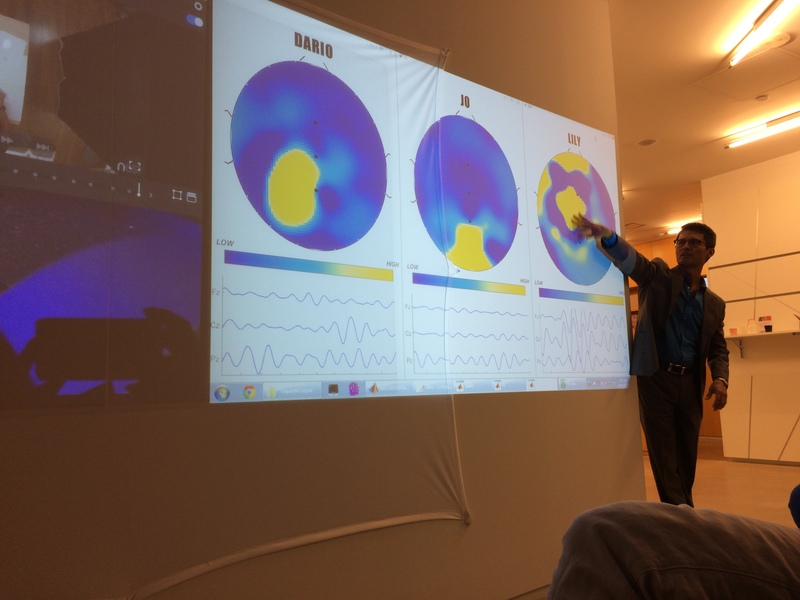 As they worked on their pieces, a screen on the wall showed their brain activity in blots of blue and yellow. To Cox-Richard, it’s a unique chance to help bridge the worlds of art and science. “Being able to contribute and have it be a two-way street is part of what seemed like a really excellent opportunity for all of us to push this conversation forward,” she says. It was just one of a series of similar experiments Contreras-Vidal has launched. The project is being made possible by funding from the National Science Foundation to advance science and health by studying the brain in action. Contreras-Vidal explains that, even though art is used as a form of therapy, there’s still a mystery surrounding what’s taking place up there to make it therapeutic. While there have already been studies showing how creativity influences the brain, this one is different. What separates it from others is the fact that the brain is being monitored outside of the lab, such as while walking through a museum, creating art in a studio, or even dancing onstage. I decided to find out. In the second part of this story, we’ll pick up with my EEG gallery stroll, followed by a visit to Contreras-Vidal’s laboratory to get the results. As Houston Public Media Arts and Culture reporter, Amy Bishop spotlights Houston’s dynamic creative community. Her stories have brought national exposure to the local arts scene through NPR programs such as Here and Now.